Ideal for Laundry, Aviation, and Space Industries! TC/American Patented Track Cranes, monorails and runways are made of special steel containing a high carbon and manganese content. This makes the running surfaces extremely hard and tough due to the chemistry of the steel. This special material provides the perfect running surface for the cranes and runways with our articulating trolleys. For this reason TC American Patented Track is an economical choice where superior wear and smooth running surface is a priority. A unique feature of TC American patented track is the utilization of multi-wheel articulating trolleys which provide equal weight distribution which in turn lessens the wear on the system. 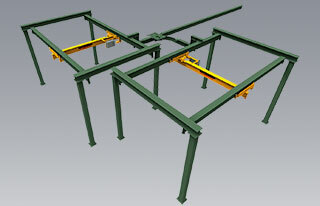 Typical I-Beam and Wide Flange structural steel systems are rigid and thus rocking and load shifts can cause extra wear. Standard structural steel systems (I-Beams and Wide Flange) are subject to rolling of the flanges also known as peening. 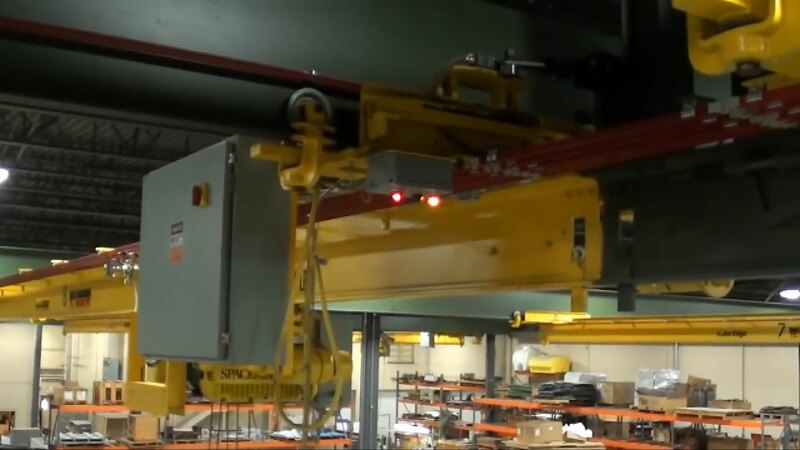 When considering a patented track system whether a monorail, or bridge crane keep in mind they do not take up any floor space as compared to a ground based material handling system. All of the systems are designed to meet your exact requirements whether a basic hand push trolley, monorail or heavy duty bridge crane. These are engineered utilizing our 200, 325, 400 or 450 series rail. With over 80 years in the patented track market as TC American, American Monorail, Twin City Monorail and Spanmaster, let our experienced sales engineers design a system to fit your applications specific needs. The 200 Series systems are ideal for laundries. 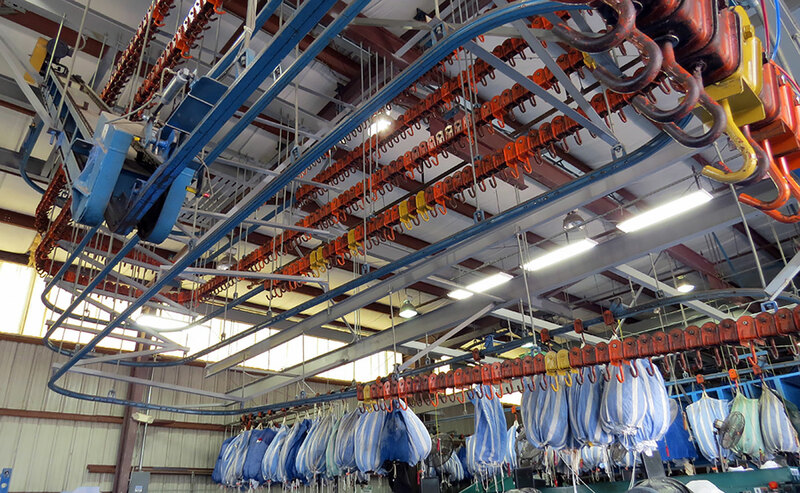 The TC American monorail systems include proper switches, curves and special trolleys for the laundry industry. Laundry monorails reduce workers handling of linens and increase the available floor space by getting the laundry off the floor. With reduced handling the employee’s injury rate and fatigue are minimized. Customizable hanger locations can be place anywhere along the monorail and up to 12" off splice centerline. Lightweight design makes installation quick and easy. Systems have compact switches and short radius curves which provide installation ease. Available with interlocks to transfer load crane to crane or crane to monorail. Ergonomic Partners is a master distributor for Patented Track, TC/American Monorail, Twin City Monorail and Spanmaster; serving clients from coast to coast, Canada, Mexico and especially focused in the states of Missouri, Illinois, Indiana, Kansas, Arkansas, Mississippi, Nebraska, Tennessee, Kentucky, Iowa, and Oklahoma.